B acalao is Spanish for codfish, and this authentic bacalao recipe, or one very like it, is cooked all over Mexico for traditional Christmas Eve and New Year's eve feasts. You can buy dried salt cod throughout the year in Mexico, but it's seen most commonly around the holidays. In San Miguel de Allende, you'll find it, among other places, at the Tuesday Market, el Tianguis in the form of long flat slabs of dried and salted fish. Just cut the pieces to fit your pan and you're good to go. Like most authentic Mexican recipes, any bacalao recipe has variations galore. Some call for wine, some add raisins, almonds, cinnamon. You'll see many different types of peppers called for. 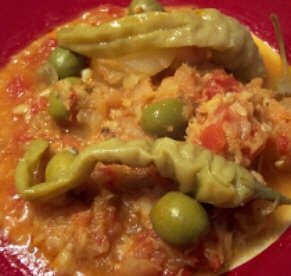 But the staples of the traditional holiday "Bacalao a la Viscaina" recipe always includes some form of tomatoes, onion, garlic, green olives and lots of good olive oil. I was given this bacalao recipe by the mother of a Mexican friend—a wonderful cook—and it sticks close to tradition. The secret is to soak the dried salt cod well to reconstitute it and get rid of most of the salt that preserves it. Try this bacalao recipe for Christmas Eve and feel the pleasure of this so-Mexican holiday comfort food. 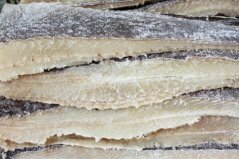 Lay the pieces of salt cod in a glass or ceramic dish (not metal) and cover with cold water. Put in the refrigerator and soak at least 24 hours, changing the water every 3-4 hours. This will reconstitute the fish and take out the saltiness. After soaking, remove from water and rinse well. Put it in a saucepan with fresh water and bring to a boil. Lower heat and simmer until fish is just cooked but not falling apart, 2-3 minutes. Gently pull the skin away, remove the bones and cut or shred into bite-sized pieces. Cut the potatoes into bite-sized pieces. In a medium saucepan, bring water to a boil, add potatoes, lower heat to simmer and cook until just tender when pierced with a fork, 15-20 minutes. Drain potatoes, let cool enough to handle then peel. Set aside. In a large, heavy saucepan, saute the onion and garlic in the olive oil until transparent and soft. Add the pureed tomatoes and parsley and bring to a boil. Lower the heat and simmer gently until the sauce begins to thicken, about 10 minutes. Add the prepared fish, cooked potatoes, the chiles gueros with a little of their juice, the raisins and almonds. Cover and let cook gently for 15-20 minutes. Just before serving, add the olives and capers and heat through. Serve with good crusty bread and a nice wine for toasting in the holiday! When you serve up this delicious and traditional bacalao recipe, you'll be giving your family and guests a taste of true Mexican holiday comfort food.